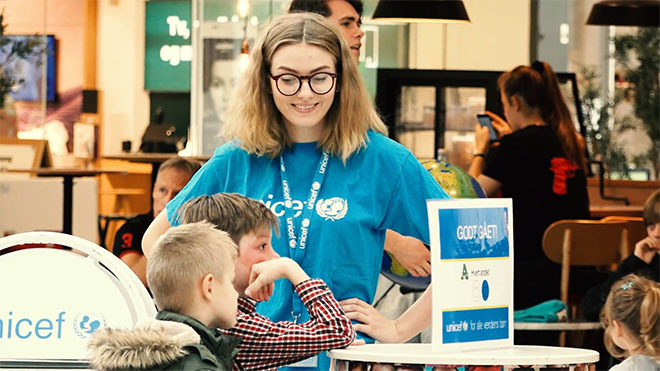 Become a promoter or telemarketing fundraiser at UNICEF Denmark and help make an important difference for vulnerable children. As a fundraiser, you help ensure that UNICEF can act when disasters strike. We provide children access to vaccines and health clinics, and we ensure that the children can attend school. Magnus is a Team Leader at UNICEF Denmark. In this video he shares his first impression of being a new fundraiser, and the funniest experience as a promoter. Line works as a telemarketing fundraiser. 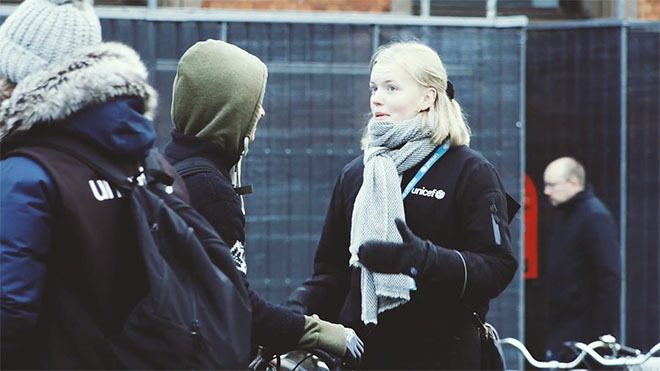 In this video she shares what it is like to work at UNICEF Denmark, and why she opted to seek that specific position. See vacancies in UNICEF Denmark by clicking on the desired position below. As a promoter, your task is to recruit new world parents on the streets and at events. You become part of a highly motivated team, where social unity and commitment are paramount. You have a team leader that contribute to your professional development and helps the team keep motivation and engagement high throughout the shift. As a fundraiser at UNICEF, you get the best fundraising education on the market, and we ensure continuous competence development and sparring. If you excel at fundraising there are good opportunities to advance. Eg. several members of our management team used to be fundraisers – With time, good results and the right attitude a lot can be achieved! See for yourself how the promoters work!